Bees and their honey have nothing over this Hornet and her spud. Bridgett Blough ’04 grew up in a farming community in rural Coloma Township in Michigan eating potatoes with most every meal. Good locally-grown food was a staple on her mama’s table. On January 12, Blough took her love of potatoes to the Spud Nation Throwdown at the Potato Expo 2016 in Las Vegas, Nevada, where she won the prize for the best potato recipe by a food truck chef. 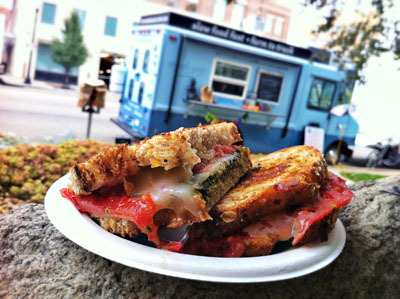 Blough is the owner of The Organic Gypsy, a food truck and catering business in Kalamazoo and Portage. She also teaches yoga at K.
When Blough began her education at Kalamazoo College, she was drawn to a first-year seminar taught by Amelia Katanski, associate professor of English. The seminar was called “Commitments,” and it was there that she says she learned about the commitment farmers make to their land and to the people who eat their produce. “That first-year seminar tied it all together for me,” Blough says. In the Spud Nation Throwdown, Blough prepared her entry on stage with two other finalists—Heather Banter, chef at Circle City Spuds in Indianapolis, Indiana, and Daniel McCarthy, chef at Tato Heads in Columbus, Ohio. Each contestant prepared his or her most creative and flavorful potato recipe. For Blough, that was her Green Tahini Potato Soup. She used Southwest Michigan-grown organic potatoes, onions, and garlic. “This is about our local food system and how people like me are working with farmers to create healthy food, improving the local economy with each meal and working toward eliminating food waste,” Blough says. Blough first prepared her special soup recipe for members of her SOUPer Club last fall. The SOUPer Club is a CSA (community supported agriculture) offered through The Organic Gypsy to a membership that includes faculty and staff at Kalamazoo College. Members receive a quart of homemade organic soup each week for six weeks for $65. This entry was posted in News Stories, People in the News and tagged alumni, awards, community, . Bookmark the permalink.